Students make their own quiz questions to give to a classmate to take. 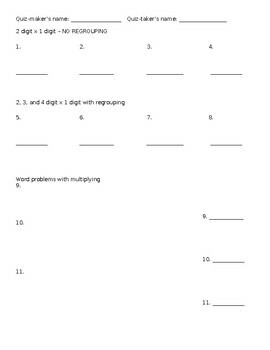 This activity is more cognitively demanding than it might seem--students have to create problems that fit the requirements (no regrouping, regrouping, and word problems) and also solve all of their own problems to make an answer key (on a separate sheet of paper) to check their classmate's work. Disagreements are a great opportunity to encourage math discourse.